Reading biblical stories is one of the most effective ways to communicate, according to one famous biblical theologian. A child can follow them and retell them. Scholars can puzzle over them endlessly to figure out what they mean. 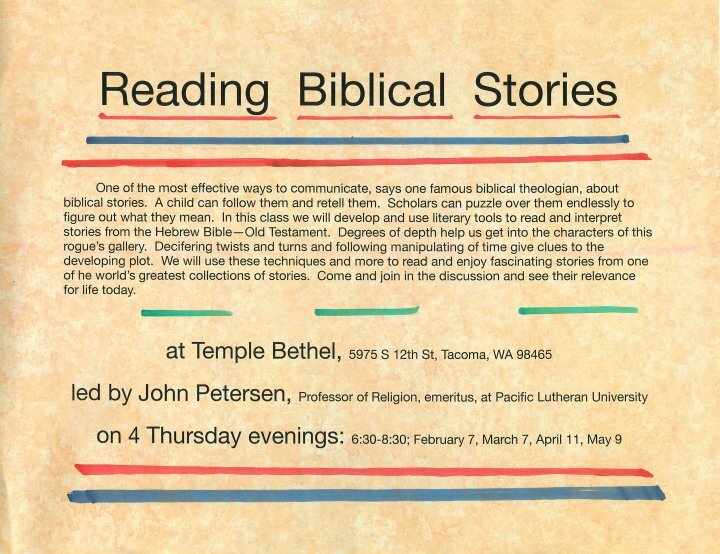 In this class we will develop and use literary tools to read and interpret stories from the Hebrew Bible—Old Testament. Degrees of depth helps us get into the characters of this rogue’s gallery. Deciphering twists and turns and following manipulations of time gives us clues to the developing plot. We will use these techniques and more to read and enjoy fascinating stories from one of the world’s greatest collections of stories. Come and join in the discussion and see their relevance for life today. Led by John Petersen, MVLC member and Professor of Religion, Emeritus, Pacific Lutheran University. Classes held at Temple Beth El, 5975 South 12th Street, Tacoma WA 98465 from 6:30 to 8:30 p.m. on four Thursday evenings—February 7, March 7, April 11, and May 9, 2019. The cost is $10 for members of Temple Beth El and $15 for non-members.